When you hear about the dentures, the first thing that comes to your mind is the removable set of teeth that stays in a solution in some of the glass vessels, while you are not using them. Now, there are great techniques that are applied, with which you can find the set of teeth always with you. Implant Supported Complete Fixed Dentures is the new technique that is applied, where the teeth set is screwed up with your jaws. Initially the screws are set on the jaws of yours through a minor operation. Once the process is completed, your jaws will find a new set of teeth, artificially made of prosthetic tissues. The gum tissues that remains with you are artificial, but look like the originals, since they are made of gum tissues. 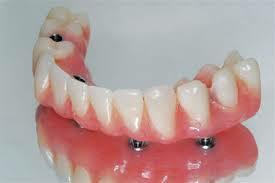 They will be cemented with the screws, to provide a fixed denture procedure for you. You will find that the implanted set is quite secured and heathy for your jaws. The gum of the teeth has been designed in such way that ensures the health of your jaw. Bacterial attacks and other menaces are kept apart through this implantation. The process is easy too, which is going to provide a complete good smile. It can sag your facial features, since the entire set of teeth is different from that you had earlier. Thus a new look is waiting for you. The bone behind the gum of yours is implanted and made secured with the new set of artificial teeth. Since the new teeth set is made from the gum tissues, chances of infection and other menaces minimises, ensuring a bright smile on your face. So get the gum care today and find a new look for you. You never know what is there for you hidden for you in the future. So, why to stop smiling when there is enough chance to do so.